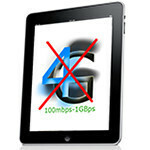 Apple's 4G marketing woes extend to Sweden and the U.K.
We reported yesterday that Apple was getting some legal flack in Australia for marketing the new iPad as “4G”, since it cannot connect to LTE services outside of North America. Now consumer complaints have extended to Sweden and the United Kingdom, where regulatory bodies are considering opening an investigation. Apple was quick to respond to the first round of complaints, offering to refund any Australian purchasers who wanted to return their “not 4G” iPads, and we imagine they will be quick to take action if necessary in Europe as well. Part of the problem stems from differences in how the United States regulates the term “4G”. Initially 4G was supposed to only apply to LTE networks, but lobbying from U.S. carriers lead to a change of policy that allowed HSPA+ networks to brand themselves 4G as well. This issue reared its head recently when the iPhone 4S on AT&T was updated to show “4G” coverage when in range of an HSPA+ network. Other countries have not made the shift – Australia, for example, still only allows the 4G label to be applied to LTE. As a result, Apple’s “WiFi + 4G” claims for the new iPad are not correct in those countries, as the LTE bands do not work with local networks, and the HSPA+ radio isn’t 4G. Apple has offered to post disclaimers in its advertising and stores, which would presumably ensure that future customers aren’t misled. Obviously we don’t believe that customers should be tricked into buying a product under false pretenses, but in this case it’s doubtful that anything more malicious happened then a company not paying attention to labeling requirements in different countries. If Apple updates its marketing material and extends its offer to take back iPads from unhappy customers in Europe as well, we imagine that the issue will quickly fade away. Oh boy, Apple screw up, however I know Apple fan will still buy apple product regardless false claim. The claim wasn't false because there is no standard for 4g. Its only false in the sense of what the country the products is being sold in is considered 4g. A mere mistake by apple which they will have to pay for. It's not about complaining, it's about setting the record straight and putting an end to false advertising. ITC should have no say in the matter since they were not part of network design, at all. like normal, u can blame the american carriers for muddying the waters. Technically, even by the 14.4 rule, Sprint Wimax still does not qualify by speed, but by the tech it uses, since it maxes at 12mb/s theoretical. Its an "either/or" type of thing. If your using a "4g tech", or your achieving "4g speeds", then u get to call it 4g. actually it is complaining, btw. the record is straight. the "ruling bodies" have spoken a long time ago about the issue. There are a few people in some sort of odd denial about it, like you, that tout that your opinion is right and they are wrong. The reality is that no matter how strongly you feel, the rules do not agree with you. Its time to get over it. Have a beer for your dead homie, and move on. Chill out dude they are taking back tablets if people felt mislead. The righted their wrong and should be thus forgiven. And it doesn't seem like it was intentional as the iPad would be considered 4g in other markets it seems like a mere mistake. biophone I am only having fun with this. All companies make mistakes. Some just do it more often than others. (Apple) I am really just trying to have some fun with it that's all. Plus today is the first day in quite some time that it has been slow so I am enjoying this day more than most! This is probably the first time we have seen people wake up,stand up for their rights and demand refunds after being misled by apple,If this had this awakening had happened before Apple would have a much much higher return rate! Its almost funny that apple are admitting it and claim its not the ipads fault its your networks! While these people have woken up there are still a huge load of people thinking their iphone 4 is 4g because apple labelled it that way as its the 4th generation. I don't get why Apple didn't make iPads that were specific to each country/region. They did; the problem is that they were only supposed to use the Try-Pads on wi-fi. LMAO, quick someone sue that vile company! Speak their language! Strange to think that a company that has the capacity to spend untold millions attempting to litigate for violation against the most intricate and technical aspects of a patent, can make such a stupid "mistake". I smell a rat. and I think it's in cupertino. That iphonearena can suggest this is an "olive branch" (as stated in the original article about Aus) also shows a vested interest in protecting their fan base..... The ACCC ( Aus Consumer watchdog) threatened legal action and Apple have taken this path in attempt to mitigate the bad PR fallout. Too late it seems, as they've already been smashed and they're arrogance in applying a "US" interpretation on "4G" to the rest of the world has created this mess. Speed alone, up or down, shouldn't be the determining factor as to what "generation" a technology is. Injecting NO2 in an older internal combustion engine doesn't actually make it a newer engine technology does it? HSPA+ should be branded accordingly as a 3G technology w/ 4G-like speeds. How about 3GT? because you will confuse 90% of the people out there that dont know any better... thats why. its just easier to call it 4g at a certain speed. they dont care whats in it as long as it goes fast. I guess I'm just a stickler, but I think you're right.